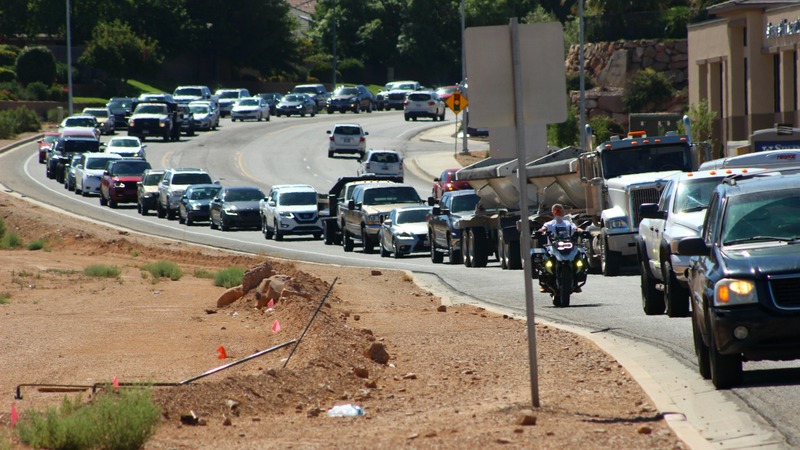 ST. GEORGE — One driver was cited and two vehicles were heavily damaged after a crash at an intersection on South River Road caused a backup of cars during heavy traffic Wednesday morning. Officers and emergency responders were dispatched to a two-vehicle crash with possible injuries at the intersection of South River Road and 1450 South involving a blue Volkswagen and a dark green Jeep Liberty shortly before 11:30 a.m, St. George Police officer Andy Mickelson said. Officers found the vehicles in the middle of the intersection partially blocking traffic in both directions and were soon joined by emergency personnel who began tending to the scene as officers redirected traffic away from the crash. Paramedics arrived to evaluate those involved for injuries, and one driver sustained a minor injury when the airbags deployed upon impact, Mickelson said. After speaking with the drivers and witnesses at the scene, officers determined that the woman driving the Volkswagen was heading south on River Road while the Jeep was heading north on the same street. 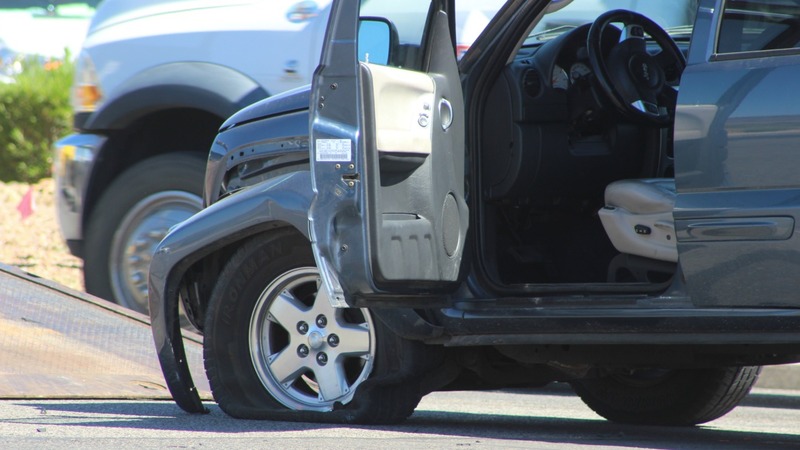 The Volkswagen merged into the left-turn lane at the intersection, and, on a green light, the driver pulled forward and began making the turn to head east on 1450 South. Before completing the turn ,the Volkswagen was struck by the oncoming Jeep that was northbound on River Road. “The driver in the Volkswagen said she pulled out and then noticed that the Jeep wasn’t stopping, and the driver in the Jeep said they were too close to stop in time,” Mickelson said. The Jeep driver also told officers that the light was just turning yellow as the vehicle approached the intersection, and that the Volkswagen “turned right in front of them,” the officer added. 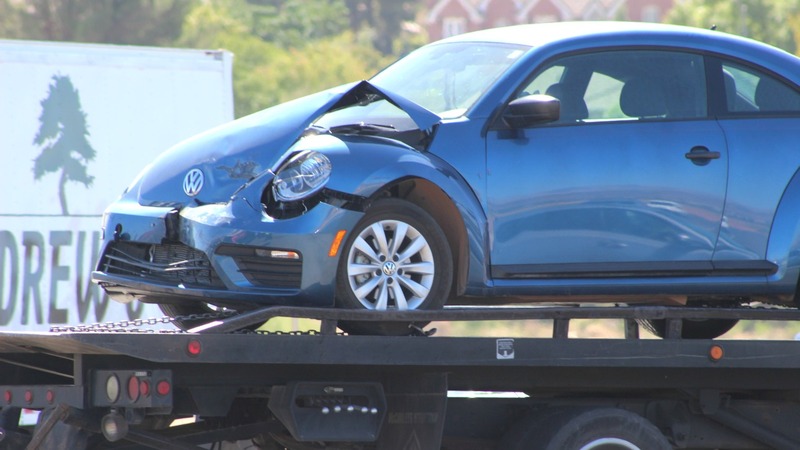 Both vehicles were significantly damaged and subsequently towed from the scene, while the driver of the Volkswagen was later cited for failing to yield on a left-hand turn. Nationally, 40 percent of all crashes involve intersections, and more than half of those involve a crossing-path vehicle involved in a left turn, while less than 6 percent involve a right turn, federal data shows. This is one of the reasons UPS drivers, who make an average of 120 stops each day, do not make left turns unless there is no other alternative, which happens only 10 percent of the time. The directive was handed down by the company in 2004 as part of its “efficiency-optimizing efforts” to save time and money. The Insurance Institute for Highway Safety says left turns are tricky because drivers must make a complex series of judgments in a short period of time, coupled with the higher speeds that are required to make the wide-radius turns through the intersection and the A-pillars, part of the car frame used to hold the windshield in place, can create blind spots, and all contribute to the higher crash rate. Again, another Utah Left………..what’s up people?